There is a reason many of our best endurance athletes live in and train at altitude: altitude training improves performance. The real question is can amateur athletes achieve similar results without moving to Boulder, Colorado. Over the past year, I’ve tried to find an answer that question by training with the Elevation Training Mask 2.0. Strange things happen to my body beyond 15 miles. In each of my 3 attempts at the Route 66 Marathon, I endured breathing that felt like a friendly grizzly bear was hugging me to death. Not only does that feeling make it tough to run, it also makes me question whether it’s just normal long mileage exhaustion or something much, much worse. At the outset of every long training run or marathon, I promise my wife I won’t die, and when you’re struggling for each breath, it’s tough to decide between keeping a promise and going for a PR. After the 2013 Route 66 Marathon, my frustration with my breathing led me to the Elevation Training Mask 2.0. Prior to purchasing the Elevation Training Mask, all of the reviews I read about it indicated that wearing it was not the same as training at altitude. Although I’ve never trained distance running at altitude, I have played my fair share of tennis in both Lake Tahoe and various cities in Colorado. In my experience, the Elevation Training Mask is definitely not the same as training at altitude. But…does that matter? In my opinion, it doesn’t matter. If you don’t have mountains (or $2,000+ for a hypoxic air generator and tent), you don’t have any elevation for training. If you don’t have any elevation for training, how many other options do you have? We’ll get to options in a minute, but first, let’s talk abut the product itself and the benefits I’ve seen from using it. The Elevation Training Mask is a rubber mask that fits over your mouth and nose. It has 2 intake ports with interchangeable valves to control the level of breathing restriction. The documentation equates each intake valve with an elevation ranging from 3,000 to 18,000 feet in 3,000 feet increments. There is one exhaust valve in the center that seals upon intake. It’s not unlike simple respirators available at your local hardware store. Unfortunately, the Elevation Training Mask is not comfortable. The mask must seal around your face so that you inhale and exhale only through the 2 intake ports and 1 exhaust port respectively. The rubber-like material chosen does not feel great after a few miles of sweat, and with some facial hair, you have to crank it down that much tighter to get a good seal. The velcro strap that secures it to the back of your head does not fit me well and always feels like it’s slipping down my neck. There is also a strap that goes over the top of your head to help hold the horizontal strap in place vertically. The top strap seems more like an afterthought than a properly thought out design, but it works for its intended purpose. Like I said above, this mask bears a striking resemblance to respirators available from hardware stores. Respirators come in 2 basic varieties, disposable and reusable. While either mask could potentially be used for this kind of training, I think you’ll find either alternative less than ideal. One is made of cloth and gets soaked with sweat which restricts breathing too much, and the other can be larger, heavier, and difficult to wear when running. In both cases, there is no straightforward way to control the level of intake restriction (i.e. altitude). Getting beyond the product design, fit, and comfort, let’s talk about the benefits. The benefit I wanted to see was more strength in my diaphragm for the back half of the marathon, but a funny thing happened along the way. I got faster. Within a month of occasional use of the Elevation Training Mask, I went from barely being able to run 1 lap on my treadmill at 10 mph to running 3-4 laps. I don’t know if you can attribute all of that progress to the Elevation Training Mask, but I think it’s reasonable to attribute some of it to the Elevation Training Mask (look ma, no science!). 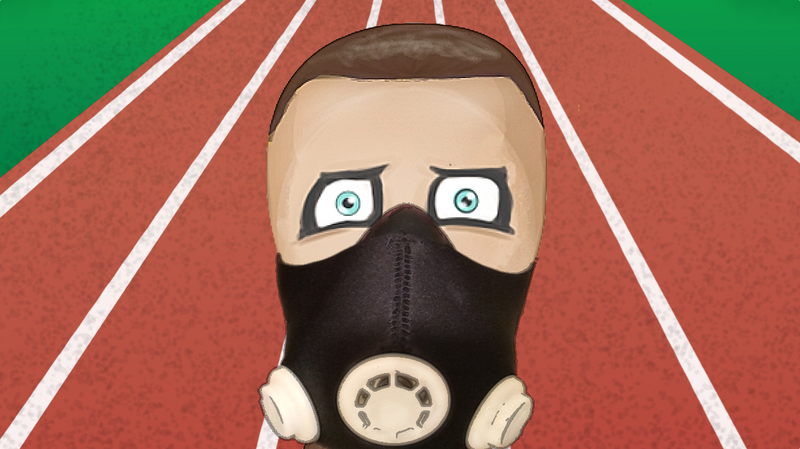 Unfortunately, I was injured in my first marathon after beginning to use the Elevation Training Mask. The injury forced me to walk a lot on the back half of the course so it was hard to know if my breathing had improved. I can say that my long training runs went well enough that I never noticed a significant problem with breathing, but most of those runs topped out around 20 miles. The breathing problems usually don’t show up for me until that last 10K. Like I said, I’m not offering you any science. I’m telling you flat out that this is not altitude training, and the jury is still out on whether or not this will help with my particular endurance problems. That said, I can tell you that I do not consider the money wasted, and I continue to use the Elevation Training Mask at least 2-3x per month to supplement my training. It might be important to note that I do have very mild asthma, and the limiting factor in my running speed is almost always my lungs. My speed improvements as a result of training with the Elevation Training Mask may be unique to my lung condition.